Happy Chap Goh Meh! I’m sure most of you will spend time with family and love ones. Well I would like to end my Chinese New Year dishes with this Nian Gao puff. I like the “melted” filling of Nian Gao while having them hot warm. This pastry recipe is using yeast. Therefore feel like having bread surrounded by pastry. Do try! Use any filling you like. 1. Mix all ingredients (A) to form smooth dough. Cover and rest for 15 minutes. 2. While waiting prepare oil dough. Mix all till form dough. 3. 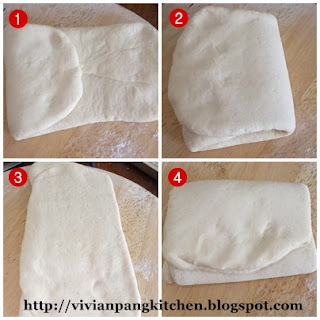 Divide both water and oil dough into 2 equal portions. Wrap the oil dough inside the water dough. Seal and proceed with the next one. 4. Place the ball on the lightly floured surface. Roll out into rectangle. Fold 1/3 to the center and the other 1/3 on top. Repeat the same process one more time. 5. Roll out the dough into rectangle. 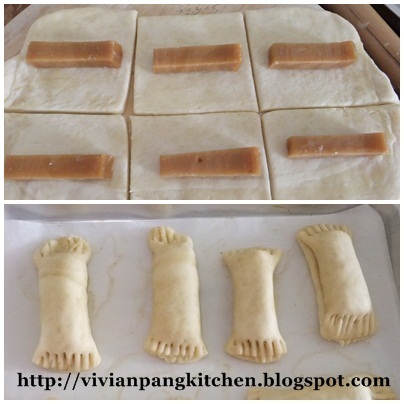 Divide into 6 portions (use the length of Nian Gao as guide). Place the Nian Gao inside and wrap. Make sure the closing is facing down. Press with fork to seal both edges. 6. Brush the puff with egg wash. Make some cuts on it. Bake in preheated oven 180C for 20 minutes. 7. Remove and cool on wire rack. Best to serve warm. Enjoy! I’m submitting this post to Aspiring Bakers #15: Auspicious Dishes for CNY (January 2012) hosted by Wen of Wen's Delight and Muhibbah Malaysian Monday hosted by Suresh. Hi Vivian, I have an award for you. Please claim it at my blog. Thanks for your support to AB. Happy Yuan Xiao Jie! Lovely! And thanks for your stepby step photos! Happy yuanxiaojie! lard!..i'm sure the pastry tasted very good! Hello! Your recipe and the picture looks good!! But can I ask, what is the purpose of yeast in the water dough? Thanks!